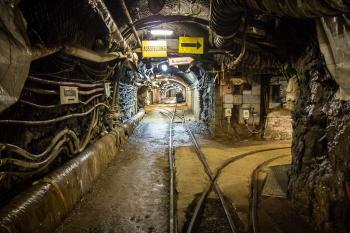 The Mines of Rammelsberg, Historic Town of Goslar and Upper Harz Water Management System constitutes of one of the largest mining and metallurgical complexes for non-ferrous metals in Europe. 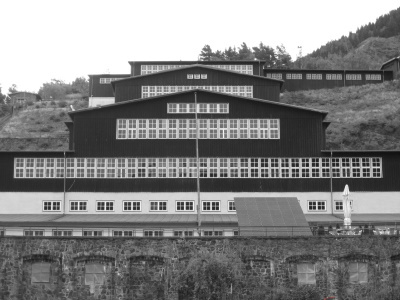 The Rammelsberg mining complex was in continuous use for at least 1000 years, before it closed its doors in 1988 due to exhaustion. The uniqueness of this site lies in its long history of mining and metal production. A variety of metals were discovered here over the ages, including copper, zinc, lead, silver and gold. 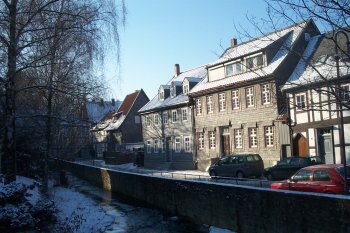 The nearby town of Goslar owns its level of development to the mining industry. It achieved great prosperity in the late Middle Ages thanks to the revenues from mining, metal production and trade. 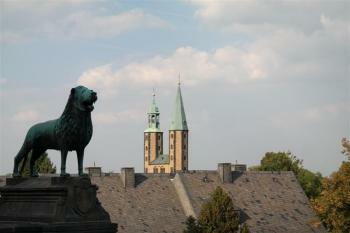 Goslar also played an important role in the Hanseatic League. In and around Rammelsberg and Goslar a great number of monuments give testimony to this period in history. Among the worldheritage listed are mine-owners' houses, underground tunnels and transportation tracks , office buildings and churches. Over 1000 years of history is cumulated in this WHS, part industrial heritage, part medieval town. The numerous monuments are within walking distance from each other and make a good day trip. Visiting mines becomes a common pastime when you're trying to tick off all WHS. Salt mines, gold mines, coal mines - they're numerous on the List. I do still enjoy visiting them. This time I joined a tour of the Roeder tunnel system at Rammelsberg. These complex underground water ways take you along two of the 19th century water-wheels that were used as power to lift the metals above ground. As often, the confrontation with the difficult labour circumstances of the miners are the most memorable moments of an underground tour. People even had to sleep underground during the working week. Goslar itself has a fine medieval town center with many "Fachwerkhauser". As always in Germany everything is well taken care of. The streets are almost free of motorized vehicles and provide ample possibilities for just roaming around. 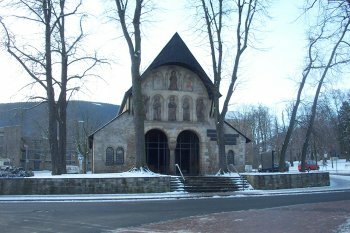 One of the best sights is the 12th century antechurch of the former Stiftskapelle (see little photo). The Goslar WHS inscription consists of 3 parts: (i) the town of Goslar, (ii) the Rammelsberg mine and (iii) the Upper Harz water management system. 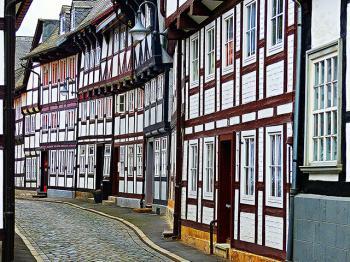 GOSLAR: like Quedlinburg, Goslar is a small town full of half-timbered houses from different centuries. Highlights are the city hall's 'Huldigungssaal' (although only a replica room can be visited and the original room can only be seen from behind a plastic window), the cathedral remains (Domvorhalle) and the emperial residence (Kaiserpfalz). 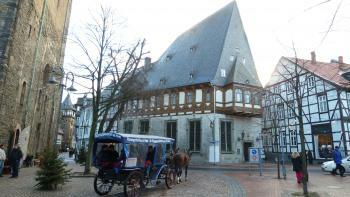 Also make sure to visit the St. Annenhaus, the town's oldest half-timbered house with a beautiful chapel. RAMMELSBERG: we took two guided tours, 'Mining in the 20th Century' and 'The Roeder Gallery'. The first one is similar to other mine tours we have followed, but with the nice addition that the tour starts with a short ride in a mine train. The Roeder Gallery tour leads you to the older tunnels with a number of water wheels which supplied (water) power. If you only have limited time, we would go for the second tour since it's something different to what is being shown in other mine tours. UPPER HARZ WATER MANAGEMENT SYSTEM: this part consists of a large number of ponds and ditches which used to power a.o. the Rammelsberg water wheels. With the Rammelsberg background in mind, it sure is interesting to see the whole water power structure but as such it is only a collection of ponds which you will probably also find in your home town/country. We also visited the former Walkenried abbey which is also part of the Upper Harz water management system WHS. Here you can visit the abbey's ruins and museum which was certainly worth the trip from Goslar (a 1h drive (one way)). An awesome site - really interesting and quite unique. I don't know how famous it is, but I'm surprised there aren't more visitors. While it may be a ‘museum’ these days, a visit to Rammelsberg feels more like a journey inside a recently abandoned mine – and that’s why it’s such a great experience. The underground tunnels have been maintained but not renovated or modernised for visitors. It is an authentic look inside centuries of industry. You can only see inside the mines as part of a tour. There are different options to choose and you can combine them to get a full experience. It might start with the train journey into the heart of the mountain and then gradually you can see the different stages of the work that occurred here. There are more recent tunnels with mechanical equipment and, as you go further, there are older tunnels, clearly rough cut, where wooden systems with pulleys and swings were built to help with the process. The way that large wooden wheels used natural water flow to power operations is really quite ingenious. This year I visited the Harz Water Management System, which has been added to this site since my previous visit to Goslar. I travelled from Goslar on bus #830 from Goslar station which took me to Clausthal, Zellerfeld and Hahnenklee. Here I found networks of reservoirs, culver5ts and water-wheels. I visited this WHS in November 2014. I visited all 3 inscribed parts namely Goslar, Rammelsberg and the Upper Harz Water Management System although I only glossed over the latter part due to the freezing temperatures outside. Goslar's Historic Centre is very quaint and is a miniature version of Quedlinburg. It has several half-timbered houses one next to the other and a splendid square with an interesting restored Rathaus and a Glockspiel. I was lucky to visit Goslar when there was a special Xmas Market rated as Germany's Best Xmas Market 2014. The highlights of Goslar were the Imperial Palace, the Cathedral Porch and the Frankenberg area and church. I found this area to be the most authentic with no restaurants or shops and a really pretty fountain. 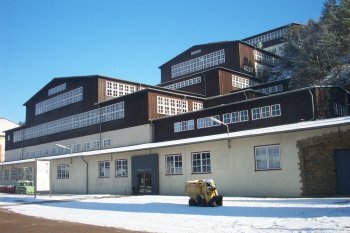 In Rammelsberg, the several pine trees were already white with some snow and frost and this really created a superb setting for the huge industrial complex. The highlight in Rammelsberg though was definitely the underground visit where the temperature (12 degrees) was much warmer than outside (-3 degrees)! I really enjoyed Goslar, though I must admit it was approaching tipping point as its central streets filled up with large groups of tourists moving en mass between Glühwein stands. A visit between Christmas and New Year meant that it was only possible/ practical to visit one part of this inscription, however the centre of Goslar proved to be a very worthwhile destination all by itself. The streets of half timbered buildings and grander civic edifices left no doubt as to which part of Europe you were in. My first stop was the Rathaus; its steps provided a nice overview of the stalls clustered on the main square; however the real highlight was the magnificent painted hall where council meeting used to take place. It was a real treat that I wasn’t expecting and because I wasn’t in the German language film screening, it meant I had a fair bit of time to explore it by myself from the odd glass bubble erected to protect its fragile decorations. After exiting I watched the glockenspiel, which deserves special mention for containing miners in contemporary dress, which added a nice touch to something that are normally viciously underwhelming. After nipping in for a quick Kaffee und Kuchen to escape a brief sleety shower, I ventured off to the Kaiserpfalz and again was impressed by a painted interior. This time it wasn’t a delicate medieval display of civic and religious pride, but instead a full-on Wagnerian interpretation of the myths and events around birth of the German nation; A really interesting if relentlessly bombastic history lesson. Aimless wandering led me back to the city centre which in the festive period housed the finest Christmas market I have ever been to (I have been to a lot of them, every British settlement of any size seems to trade pedestrian spaces between chain stores for a German market from mid November every year. I was a little surprised that there were still enough German merchants left in their homeland to set up and run them there). As well as the usual array of wooden toys and Bratwursts they managed to squeeze in a fairly sizeable copse of pine trees and couple of llamas circling the infant Christ in his manger (must have missed those bible verses). So I only got to visit one of the three main parts of the site, however it was so enjoyable I would have no problem dragging myself and others back in future for further exploration. Whilst the groups of older locals flocking through the Christmas market were a touch inconvenient at times; it really added to the atmosphere, especially when a group distributed festive treats to the passengers on the train into the city. A lovely city and I would happily return to explore the industrial infrastructure which is also included in this inscription. 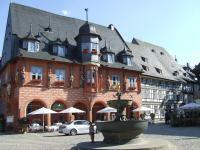 This WHS consists of three parts: the Historic Town of Goslar, the Mines of Rammelsberg and the Upper Harz Water Management. Goslar and Rammelsberg are well described by the previous reviews, so I will focus on the extension in 2010. The Upper Harz Water Management is a sophisticated water distribution system, which was used in the 16th to 19th Century by the miners to drive pumps and water wheels. A major problem for the miners was the infiltration of water into the shafts and tunnels. Hydro power was used to remove it: “raising water with water” was the principle. The first ponds and dams have been built 800 years ago by monks (Abbey Walkenried is also part of the WHS). Today, more than 60 ponds, many dams, and kilometres of ditches and water tunnels are still visible. The area extends over about 200 square kilometres south of Goslar, most of the ponds are around the town of Clausthal-Zellerfeld. There I bought a hiking map and chose some places that seemed to be the most interesting. I was travelling by car, so it was easy to get there. In the village Bockswiese, I hiked along four ponds on different levels that were connected by historical ditches. Other nice places are the “Carler Teich” (Carl Pond, west of Zellerfeld) and the “Pfauenteiche” (Peacock Ponds, south east of Clausthal). 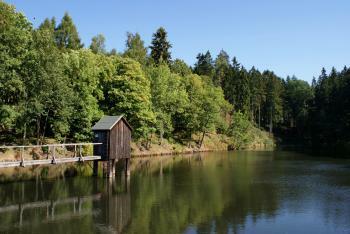 The "Carler Teich" is one of the few ponds where the so-called “Striegelhaus” has been preserved until today (photo). These small huts were connected by a footbridge with the dam. From the Striegelhaus once the simple device to open and close the outflow of the reservoir was operated. Next to the dam you can also visit the reconstruction of a historic flatrod system with a water wheel. My visit was in August 2009, it was a warm summer day and I really enjoyed the hike through woods and across meadows. When the weather is fine, I can recommend to spend there a whole day out in the green. The stately medieval buildings that today surround the Market Place are testimony to the value of preserving heritage. Fortunately the town centre escaped destruction in WWII and remains pristine. Exploring beyond the Market there are other examples of fine architecture in the Schuhof, the Kaiserphalz and Stiftskapella, and in the Frankenberg district. Seeing these buildings was the highlight of my visit to Goslar, although I did take a bus up to the Rammelsberg mine and take an underground tour by train to see the workings. I have visited the Rammelsberg mining museum on several occasions. It is very interesting but there is virtually no literature about it in english. I bought two small books in german about the mine which looked interesting. I have translated both of them into english bafter some time and effort. The museum seems to have no interest in them whatsoever. If you would like a .pdf copy ot the translations you can have it for free! Let me know. For anyone remotely interested in industrial archeology or geology the Rammelsberg mine is a must-see. When you approach the site and see the array of processing buildings stretching up the mountainside it is clear this is no ordinary mine relic. It dates from the 10th century and worked with few interruptions until 1988. Many of the early features survived and it is fortunate that closure took place when the social value of such places was recognised so that everything has been preserved even the miners' clothing, each man's hanging from its own ceiling hook just as it did the day it closed. There are a variety of tours both above and below ground all fascinating although English-speaking guides are not readily arranged nor is the detail of English-language written material really adequate. Nevertheless the language barrier does not prevent awe at such things as three enormous wooden water wheels (underground !) providing both power and drainage. Together with the nearby town of Goslar, whose wealth was largely dependent on the mine,and walking trails based on above ground features of mining this forms an extraordinarily complete experience of an industry and its effects. Allow a whole day for a visit! Water wheels: "the water which for hundreds of years set the four underground driving wheels in motion. Three of these waterwheels can still today be seen in their original locations"
Carillons: Goslar - on the gable of the former city treasury on the east side of the Market Square. Nunneries: Goslar: Neuwerkkirche in Goslar belonged to a nunnery until the 1960'ies. Protestantism: Goslar: Walkenried monastery (from 1546). The Kapitelsaal became a protestant church in 1570. Incorrect UNESCO 'Number of locations': The Upper Harz Water Management (2010 extension) has only one ID but multiple locations. The nomination file lists 719 ponds, ditches and water tunnels (several of them may be contiguous, but there are still plenty of different locations), plus specific monuments such as Walkenried monastery, Samson mine, Rosenhof wheel chambers, Knesebeck Shaft, Ottiliae Shaft, Kaiser Wilhelm II Shaft.